The standard bell pepper for many decades, Californian Wonder was introduced in 1928 and is still the largest open-pollinated, heirloom bell pepper that you can grow, and a big improvement over the earlier bells. Sweet Pepper 'Golden Californian Wonder' is the golden version of the green-red Californian Wonder. It is the widely adapted standard variety that is a favorite with gardeners and widely used for commercial production. The plant produces well and does well in both cool and warm weather. It consistently produces large yields of blocky, four-lobed thick-walled fruit that is mild and sweet, tender and flavourful. Resistant to Tobacco Mosaic Virus, the plant is medium tall, 60 to 70cm (24 to 28in) with good foliage cover which provides good scald protection for the fruits. 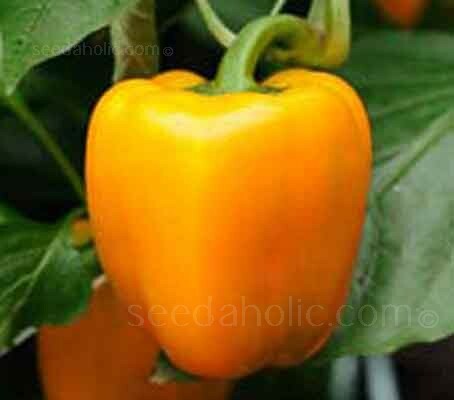 Each plant produces 4 to 5 wonderfully sweet bell peppers. This versatile sweet pepper produces large glossy green fruits which mature to golden-yellow the longer you leave them on the plant. The fruits average 170 grams (6oz) and measure 10 x 12cm (4in x 4¾in). Perfect for all cooking uses from salads, to stir-fries, grilling, stuffing and using in stews and casseroles. Sweet Peppers need a long growing season. They can be sown February to April but are best sown before the end of March. They flourish in a sunny, sheltered position on a south facing wall, in fertile, well-drained soil or grown in a green-house, in pots or in the ground. Fill small cells or trays with a good sterile seed compost and sow the seeds on the surface. 'Just cover' with a fine sprinkling of sieved compost or vermiculite. Keep the compost moist - don't let the top of the compost dry out (a common cause of germination failure) If you wish, spray the surface with a dilute copper-based fungicide. Harvesting: July to October - 70 days from transplant to harvest.